Even if you can’t actually get to a museum with your kids (yes, sometimes life gets in the way of those wonderful enrichment opportunities! ), there are some ways you can get them excited about art and build their enthusiasm for their next trip to the local art galleries. One great way to do this is by exploring the online kids’ sections of art museum websites. Many art museums have an online section devoted to kids and families, but I thought I’d share 3 really exceptional ones that I’ve come across lately. 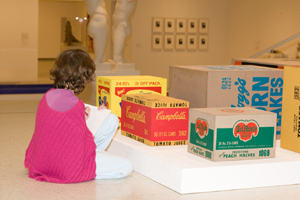 The Tate Museum has an extensive area devoted to encouraging kids to explore their collection. One thing I like about this site is that its both high tech and low tech. A couple of highlights are the Art Detective: Case of the Mysterious Object feature which lets users explore a sculpture by Henry Moore and using a fun detective analogy, try and figure out some things about what the artist was trying to achieve. A nice low-tech sort of arts and crafts option is to create a mask using one of their templates. Each mask is connected to a work in the collection. Artsconnected’s Toolkit site features short videos demonstrating various art elements, such as line, shape, color and texture, and then let’s users either find specific types of elements in artworks, or create an online work of art using the various drawing tools. This site is a great one for introducing little ones to the basic art elements. This can be brought into the museum as well by having them look for the elements in “real” works of art. Finally, check out the Museum of Modern Art’s Destination Modern Art. The site has great graphics- an adorable alien who leads kids on an exploration of a few keys pieces in MOMA’s collection, including a work by Picasso, Three Musicians and a chair designed by Marcel Breuer. Each work features several options, including games, puzzles, and some lower-tech crafts projects that can be printed out. Explore a museum website before visiting a real museum with your child. Try to connect some of the ideas and concepts raised in the online site to the works of art on view in the galleries. Visit the website for the museum you plan to attend with your child. Most museums have much of their collection online. Find a few pieces that you think your child would be interested in, and go on a “detective” hunt for those artworks once you arrive. Rather than just coloring with your child, take a look at some online works of art and see if you can use those for inspiration. Have your child make their own version of a work of art, or use some of the same colors or shapes. Museum websites can be a great way to open up a discussion about art with your child, get them excited about a visit to a museum, or encourage new ways of creativity at home. Finally, don’t forget to visit the Walker’s own website for some more online fun!